Trinity Designs: Convention Project #5! Oh, man, I'm flying home today! What a fantastic week it's been - I have so much to share with you and I'm so grateful for all that has taken place here this week! 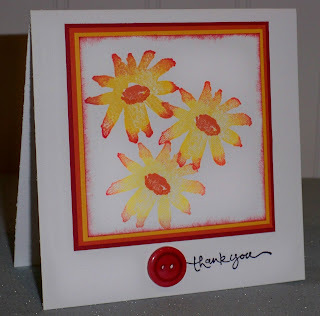 This cute card is another of my swaps and it's created with the Happiness Always Hostess Set. I used the Rock and Roll technique and the Graduated stamping techinque on this one. Wanna learn how to make it? Well, just come to stamp camp this month - it's one of our cards! The colors are Riding Hood Red, Tangerine Tango and Summer Sun. They just POP on that Whisper White background. And the cute button is from the new Button Bouquet collection! See you next weekend at stamp camp - 8/9 at 10 am! RSVP today! Great card, love the contrast of the yellow and red on the flower! I recieved this card and your other swap. You are an inspiration and I enjoyed your class at convention very much!